Well in the spirit of my last post, today's review is the Argyle Maduro Robusto from Holt's. Let's see how this cigar stacks up against the best. . .
Today, let's start with the construction of this stick. Overall for a two buck cigar the Argyle Maduro Robusto was pretty decent. 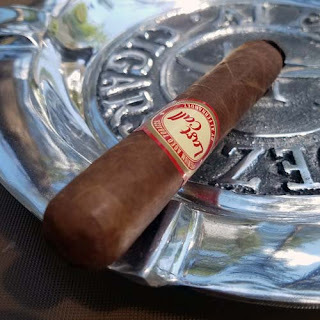 It had a triple cap, a fairly tight Connecticut broadleaf maduro wrapper, there was a bit of an oil sheen, a fair amount of tooth and it only had a couple of medium sized veins. So far not to bad. There was one small wrapper hole just above the band and there was a factory wrapper tear about half way up that had been glued down. That tear did bother me a bit, but it held tight until it had burned away. The cigar it self was packed a bit soft and it became fairly spongy once it was warm, but hey, like I said, for two bucks that's fair. In the flavor department, I thought this was a pretty good stick. There was a nice fruity aroma from the foot and the free cold draw had notes of earth, coffee and more fruit. One I had it burning there were mild bodied flavors of cocoa, fruit, brown sugar and earth. Not to shabby so far. The mix wasn't complex and didn't change much as I smoked on, but there were hints of anise, molasses, toast, with some sweet cream at the finish. The burn on this Argyle Maduro Robusto wasn't so shoddy either. It burned fairly even full length leaving behind a light/dark gray striped ash that held for the first third. As the cigar warmed up the wrapper picked up a pretty decent oil sheen and the body edged into the medium range. I almost forgot to add that cigar lasted a decent 45+ minutes. Bottom line, I wouldn't be afraid to hand one of these to a non-cigar smoking buddy while were having a beer. Actually, I read some other reviews about this cigar before smoking it. I normally don't do that because I don't want preconceived thoughts floating around in my head. I found overall this cigar rated pretty low on most sites and I'm not sure why. I do have an idea or two, but hey, I just call them as I see them and this was a decent cigar in my book. In fact, I'm smoking one right now.